Home » Integrated Urban Development » Give unused residential buildings a second chance! Haven't you ever experienced this: You are in a city with beautiful old buildings and many of them are empty and dilapidated? And you ask why? Many cities in Europe are facing this problem: vacant residential buildings (even in growing housing markets), which start to deteriorate and lose their function, even in inner city locations. This often is due to a shrinking population, suburbanisation processes or legal issues. Often older, outdated buildings are affected, which at the same time are important for the inner urban structure, the cityscape and identity of the city. Reasons are manifold for the neglect and vacancy of these buildings, among them difficult ownership situations such as unresolved ownership status, limited ability or willingness of owners to invest, multiple changes of ownership, speculation, bankruptcies of real estate developers, large communities of heirs, mortgage debt or ownerless properties. The neglected vacant buildings become increasingly a problem: Partly they constitute a public security hazard; they effected negatively the neighbouring properties; the demolition of the buildings threatens the inner urban density, the functioning traditional urban structure and the historic cityscape. This also reduces the identity-forming effect of the inner city for the citizens. However, such residential buildings, in particular with heritage values are increasingly seen as a positive quality, not only in their intrinsic qualities as spacious and valued places to live but also in terms of their potential for modern, accessible and affordable inner-city living and to provide space for needed functions in the city. Chemnitz (DE) has been facing this problem. More than 18 % of the housing stock had been vacant. It concerned in inner city locations in particular the buildings that had been built during the city’s boom years in the industrial era before World War I. The demand for modern and newly-constructed homes, the oversupply in the historic tenement sector and other reasons contributed to the severe neglect and disrepair of many of those old buildings. This in turn led to the high vacancy rate and even demolition of these buildings. The free real estate and financial markets had failed to give these buildings a second chance! 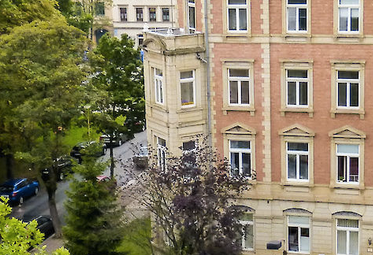 But the City of Chemnitz reacted: In 2006 based on a research project for the cost-effective renovation of old buildings through user-owner cooperation in Chemnitz, the ‘Agentur StadtWohnen Chemnitz’ (CityLiving Agency Chemnitz) was found. The goal was in particular to coordinate relevant stakeholders and support alternative housing projects in order to enable the sustainable development of unused historic apartment buildings in need of repair. In fact, the ‘Housing agency’ is a consulting service (project) for interested owners of neglected and/or vacant properties, potential investors and users with an interest in common forms of living and creative ideas for the subsequent use of buildings. From the outset of the ‘Housing agency’, its task was to function as a coordination body, which connects owners, potential users, investors and local authorities and provides them with free-of-charge consulting services for the reactivation of the vacant apartment buildings in the extended inner city where the free real estate market had failed. The services are carried out by a local private urban development company, which received this task through a public tender by the city. The ‘Housing agency’ fulfils tasks that had not been foreseen within the city administration. At the same time through the private company (WGS mbh) additional know-how and work capacities are obtained. 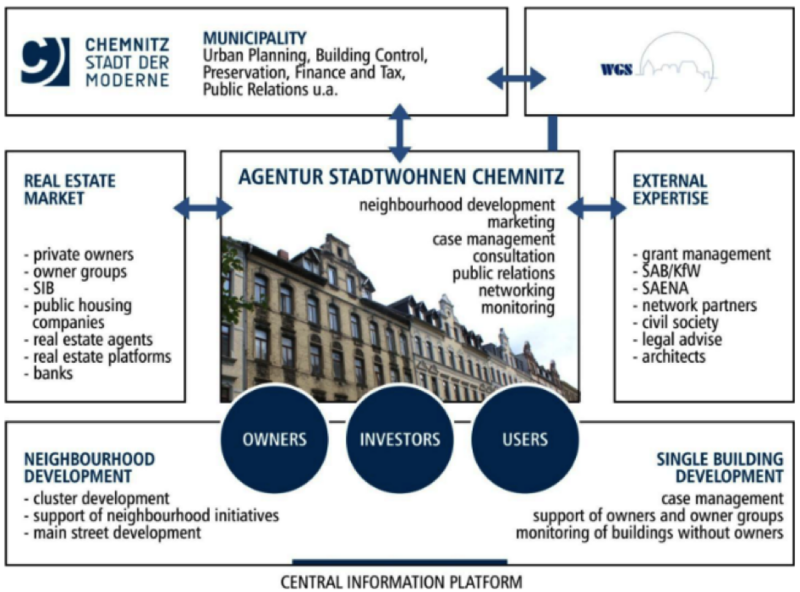 Given the fact that the City of Chemnitz usually does not directly get involved in the housing market, the privately run ‘Housing agency’ presented the possibility for the city administration to informally influence the development of buildings that are a priority for different reasons for the city. Although the services are free of charge, the Housing agency “pays off” for the city as through the reuse and revitalisation of the buildings modernised living space is created, neighbourhoods upgraded, tax revenues increased and substitution measures by the city avoided. Over the past six years, the ‘Housing agency’ has become the central collector and distributer of information on vacant tenement buildings in the extended inner city of Chemnitz. It has helped, disseminated and connected in ways that neither public authorities nor private actors alone could have achieved – through continuing communication with official partners from different segments of urban government and the informal, pro-active approach of the owners, local initiatives and players in the real estate market. “Many cities face the problem of deteriorating built heritage with vacancies and functional loss. The ‘Housing agency’ as a public project carried out by a private company offers a flexible and proactive approach to connect owners, potential investors or users and public authorities for the revitalisation of those buildings. Positive effects are the activation of owners or the change of ownership and the channelling of public grants to places where they can be used most effectively”. This Good Practice represents therefore not only a topical improvement for cities which are suffering from inner-city vacancies, but also a good example of new forms of cooperation and intermediate structures between government bodies, civil society and business which can be transferred to a variety of contexts. 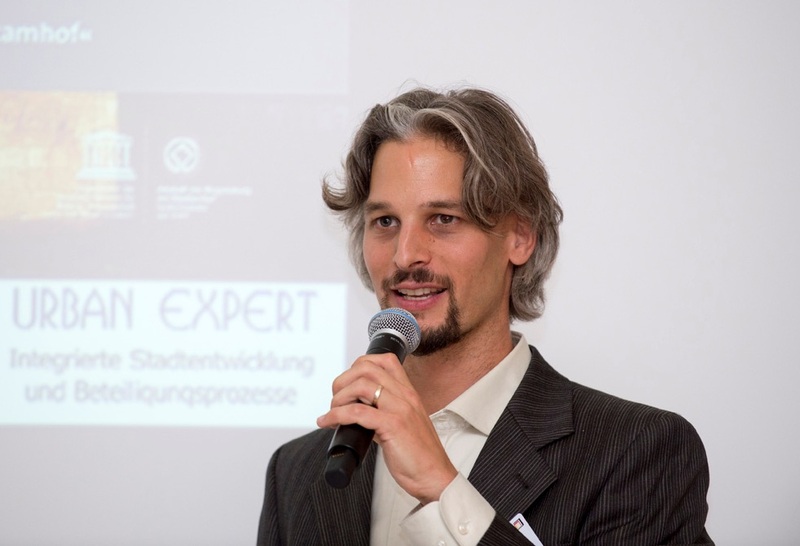 Six cities in Europe (Constanta, Riga, Rybnik, Seraing, Turin and Vilafranca) have join the URBACT Transfer Network ALT/BAU, lead by the good-practice city of Chemnitz, to transfer and adapt the good-practice model of Chemnitz’ housing agency to their local context. For this, the city partners will develop and implement within 24 months Transfer Plans of the good-practice model to their city. The intention is to help reactivate empty residential buildings in need of repair, located in or close to the inner city. This by connecting and coordinating owners, potential investors, users and public authorities through innovative partnerships. reduce the negative impact on the cityscape and neighbourhood by neglected buildings.